‘An artist, a farmer and a scientist walk into a bar …’ is a quirky title for an amazing process of learning and discovery. The idea, that these three people can engage in conversation around common subjects led to the Carbon Science: Carbon Culture Workshops at The Living Classroom on June 24 and 25. 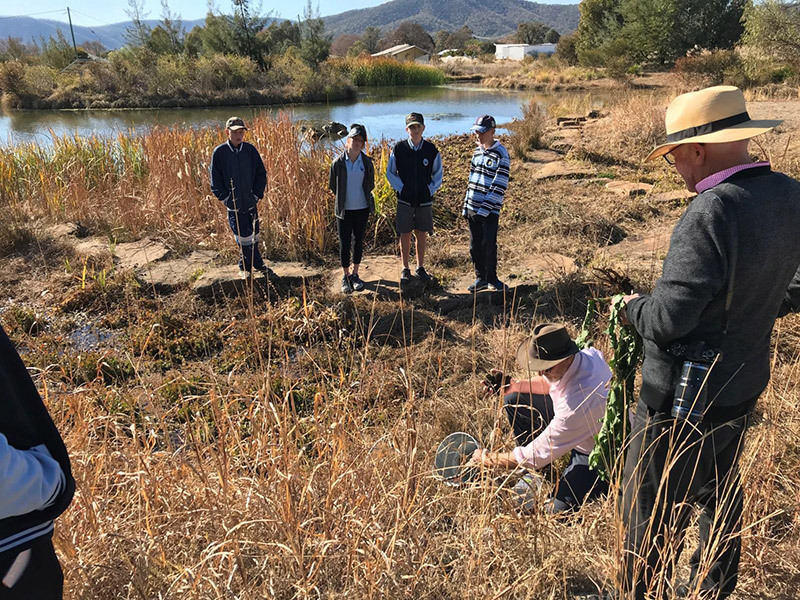 A group of artists, farmers and scientists from across our region and from other parts of the world met at The Living Classroom (TLC) to share in discovery, learning and collaboration around the theme of CARBON. 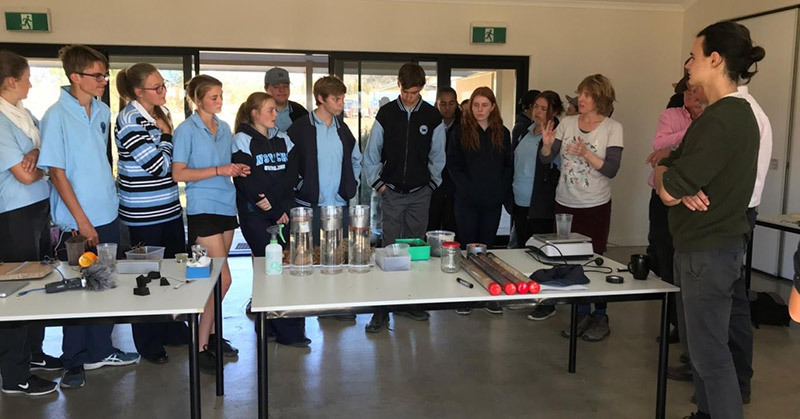 The workshops were attended by 40 visitors on the Sunday and more than 80 teachers and students from Bingara Central School on the Monday. 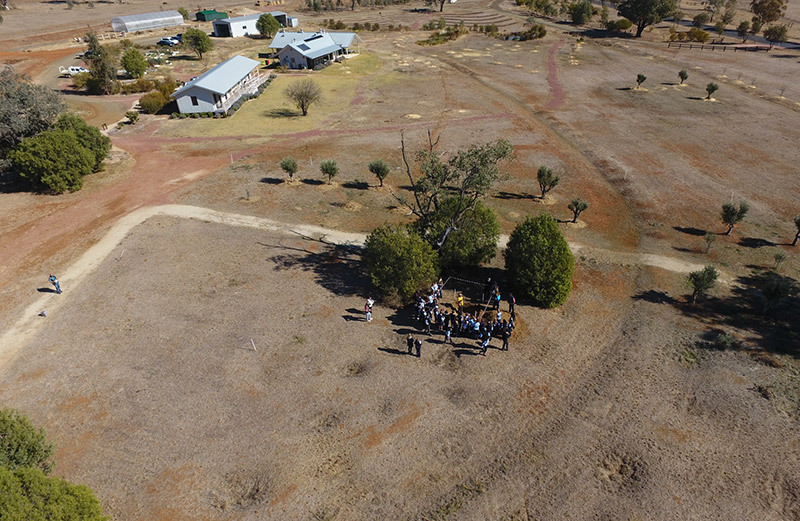 Leading the discussion and experimentation were artists Alex Wisser, Georgie Pollard, Jono Bolitho and Dr Laura Fisher, farmers Glenn Morris and Garry McDouall, and collaborators Peter Turnbull and Rick Hutton. They were very fortunate to be working with scientist Dr Ruy Anaya de la Rosa and Starfish Initiatives founder Adam Blakester – both central to a major UN project called Biochar for Sustainable Soils (B4SS) which has sites in 6 countries. This brought an international dimension to the workshops. 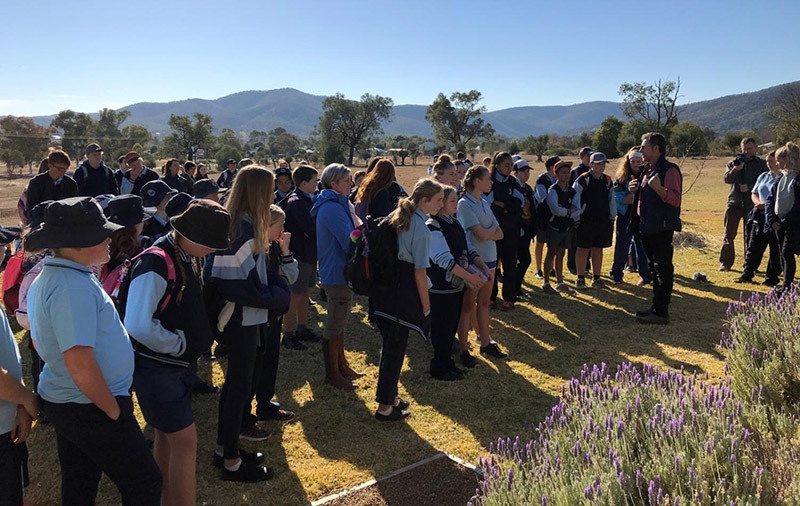 Gwydir Learning Region Manager Rick Hutton welcomes Bingara students to TLC. “Many of us hear the word ‘carbon’ pretty regularly these days, but carbon isn’t well understood, and no wonder, as it takes so many different forms. From the carbon dioxide gas that is increasing in the air we breathe to charcoal, coal and diamonds, carbon is amazing stuff. We designed these workshops so that both adults and children could think about carbon from several angles: we made charcoal drawings, created biochar, turned photosynthesis into a creative game, and used bio-sensors to test moisture content in different soils. 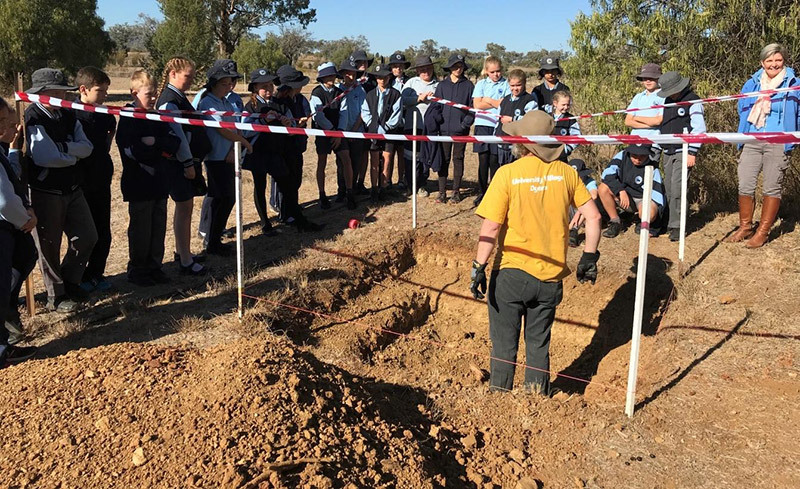 I particularly liked seeing young kids and people in their 70s collaborating on the drawing exercise, and the way the soil moisture tests gave the school kids an opportunity to discuss the impact of the current drought. Using science to understand carbon and the carbon cycle. Artists Dr Laura Fisher and Jono Bolitho share ideas about measuring carbon and water with students. Students discover how computer technology can measure water content in soils. 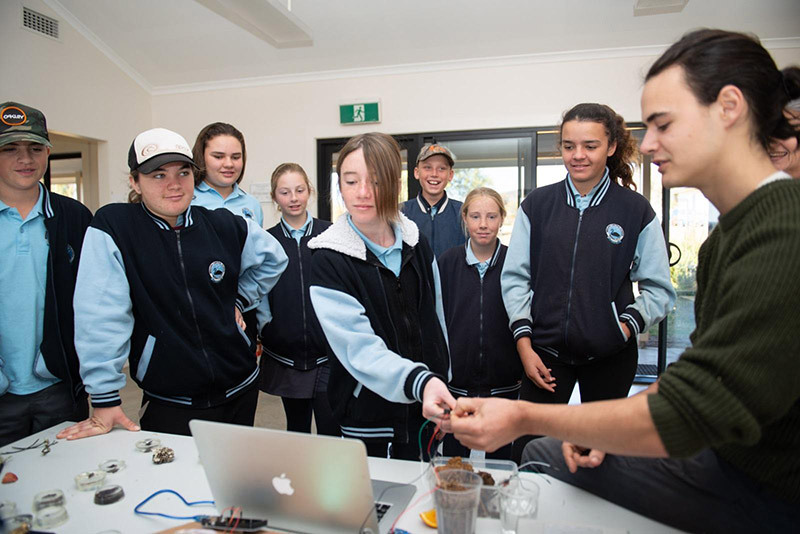 “I learnt that a computer can measure how wet the soil is.” – Isabelle. “It was a really fun day. We learnt a lot about nature and the different types of science stuff.” – Leilani. “I was interested in checking the moisture in the dirt.” – Brooke. “We learnt how to find moisture in soil using graphs or sound.” – Ezra. “I liked the thing that made a higher noise each time there was more water in the soil.” – Casey. 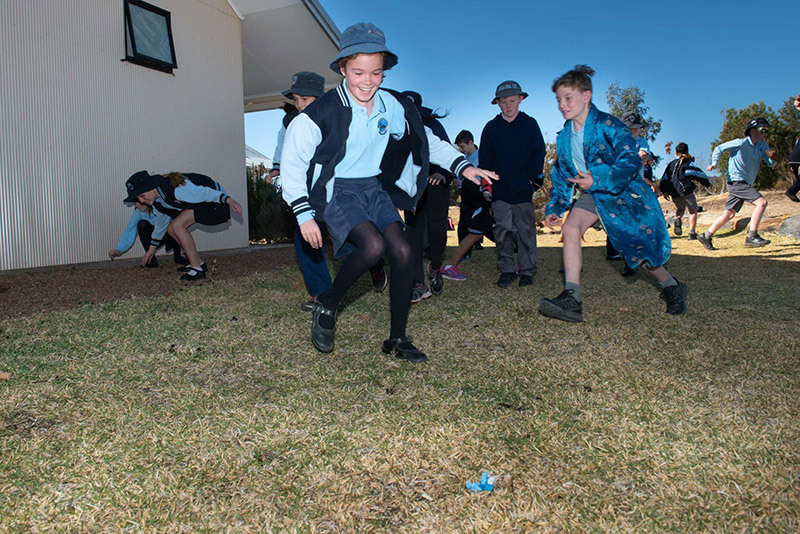 “The Stage 3 students took part in a never-tried-before photosynthesis game. With home-made costumes and props, children took on the roles of the sun, water, leaves, roots and mycorrhizal fungi. First they raced to gather and trade carbon, oxygen, vapour, sun energy and soil nutrients. Then they constructed beautiful images of plants out of fabric and found objects that displayed how all these elements make plants grow. The kids got into the spirit of the game with real enthusiasm and came up with amazing artwork in the end!”– Dr Laura Fisher. The carbon games. Students using their own energy to simulate the energy transfers in photosynthesis. Jono Bolitho oversees the Stage 3 students devising their plant artwork. Dr Ruy Anaya de la Rosa originally from Mexico City introduces students to the significance of carbon in our lives. 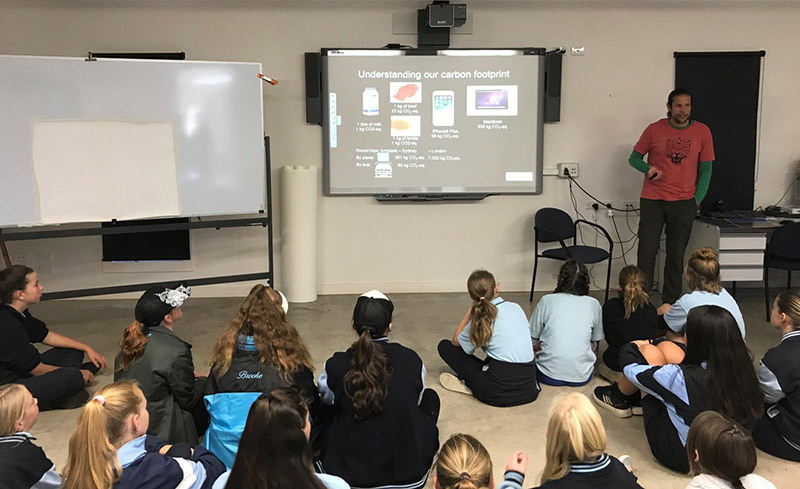 “I learned about CO2 and that one plane trip to London makes 7,000 tonnes of CO2 for every passenger, so that is very bad for the environment and that’s why people should recycle to help lower that.” – Sharnee. “I learnt how to properly use carbon and how to help the world.” – Tammy. 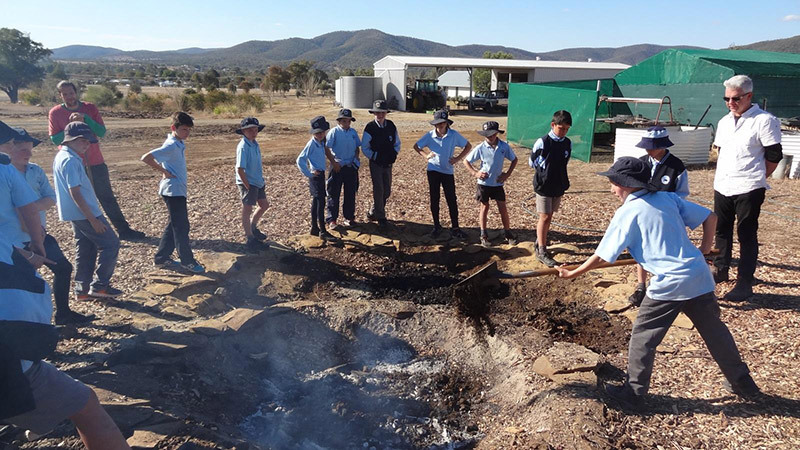 Bingara Central School Stage 3 students take turns to ‘damper down’ the flames in the biochar fire pit under the guidance of Dr Ruy Anaya de la Rosa and Adam Blakester. The biochar Kon-Tiki fire pit is lit, along with the charcoal drum oven. The students examine the biochar and the biomass materials from which it is made. “I liked learning about biochar and how to make it over a fire pit or an air tight barrel.” – Xavier. “I found the presentations very educational and interesting. I was shocked by the many things about carbon. I got to be there for a hands-on lesson with fire.” – Tammy. When a hole in the ground becomes art! “It was a brilliant group of kids who came to visit me at the site where I was digging. So switched on and intrigued, and full of questions. To tell the truth, I was a bit nervous what the kids would think of my artwork but I guess in the end, digging a hole is a universal – everyone knows what it is and at some level we understand it. There is a sense of achieving something, but also a sense of discovery, and in the end, we all can respect a bit of hard work. I was gratified that the kids seemed to get it” – Alex Wisser– Artist. Artist Alex Wisser is digging a hole. The students were fascinated by his story about how the colours and patterns in the earth are so beautiful and can tell us about our past and our future. Alex has dug the first half metre of his three metre hole. He has found remains of the old gold workings as well as an amazing variety of coloured clays, layers of charcoal, quartz rock and tree roots. “The lessons that I learnt was when Alex was digging a hole to show us all the different colours of the dirt.” – Sophie. “Alex’s hole interested me. Clay has multiple colours. I was interested by the clay colours.” – Isaak. Using carbon to make art: home-made charcoal as a basic drawing medium. 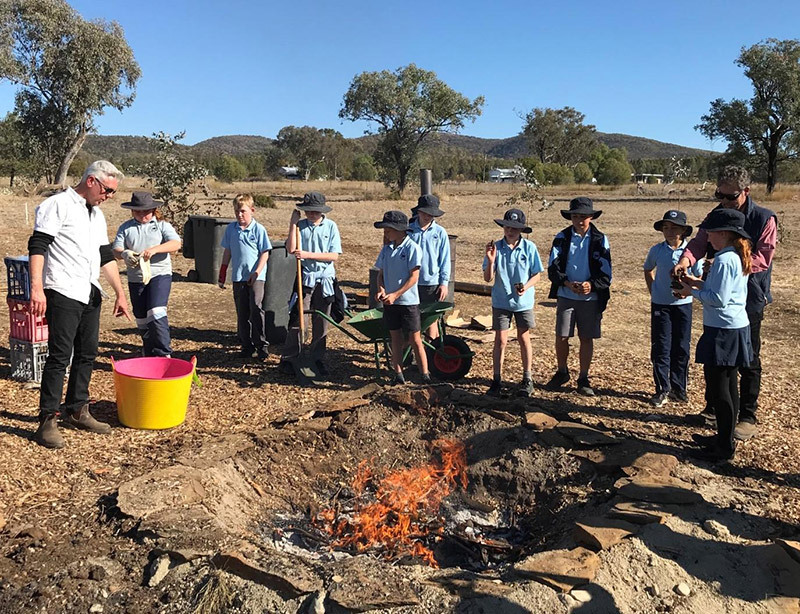 “Over the course of the day on Monday, the students of Bingara Central School participated in three drawing games using charcoal that we made at ‘The Living Classroom’. The games were based on children’s party games like “pin the tail on the donkey” and “musical chairs”. The games were an experiment in collaboration and conceptual drawing and produced beautiful, high energy, abstract images. 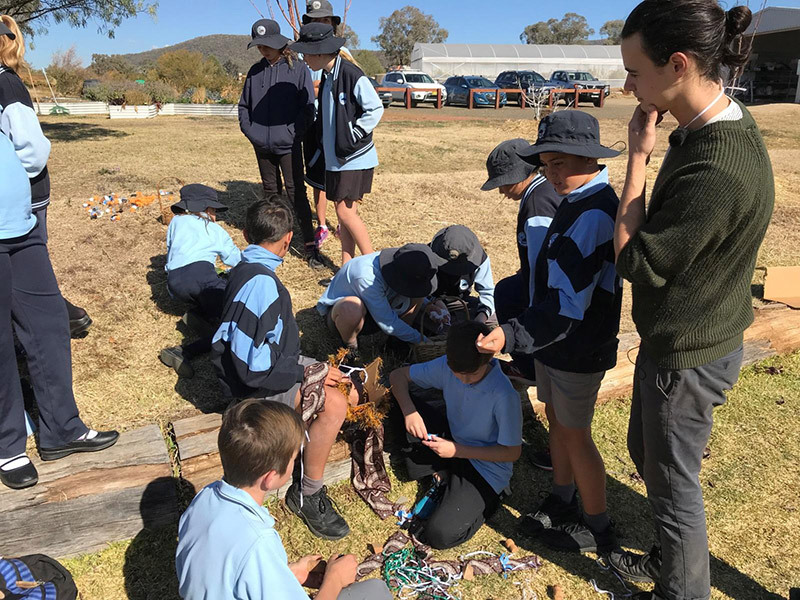 Collaboration and curiosity came naturally to the students of Bingara, they took to abstract drawing like ducks to water.” – Georgie Pollard – Artist. 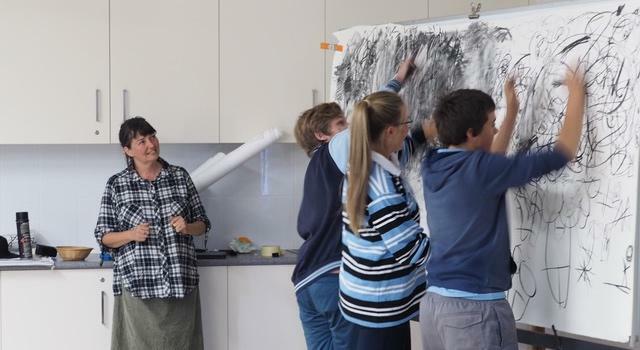 Artist Georgie Pollard watches on while students create a collaborative artwork using charcoal made at TLC. Drawing collaboratively with charcoal freshly harvested from the ‘oven’. “I thought it was a good day of learning and fun activities. My favourite was drawing with the charcoal because we got to express ourselves.” – Ezra. “I enjoyed the activity in which we drew with charcoal and felt the different textures they made on the paper.” – Savannah. “The activity that interested me most was the artist one. We all tried the charcoal that we had made. We created a drawing together as a class.” – Emily-Kate. Collecting different samples from around TLC to understand soil moisture retention. Farmers Glenn Morris and Garry McDouall take samples of soil and water at TLC. Their experiments demonstrated how different soils can store or repel water and lead to greater or lesser fertility. The Living Classroom lived up to its reputation. 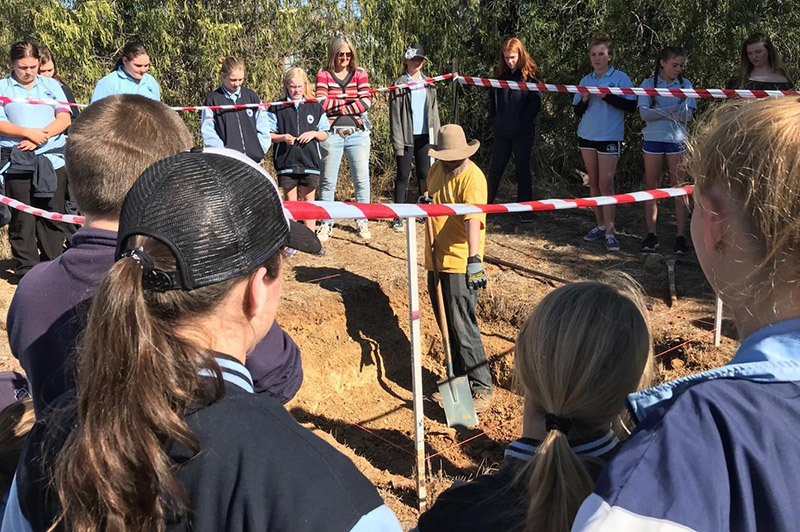 “I thought it was a fantastic day for all the students involved, learning important lessons on the foundations of life (water, climate and soil), which hopefully they will remember for a long time to come. With the help of the artists bringing fun and excitement to the science of photosynthesis and soil humus regeneration, the students couldn’t get into enough dirt. They observed how plant roots and biology could convert poor soil into a beautiful dark healthy soil, and how that soil could then hold more water like a sponge, eventually underpinning the local water cycle and thunderstorms. Personally I thought it was a really great day with a tremendous message being passed from older generations to younger generations. The message that all of us; artists, farmers, scientists, students and all of us are responsible for managing the ongoing health of our soils, our rainfall and our climate. “I thought it was fun to learn more about our environment and the soil.” – Casey. “I learnt that when water absorbs into dirt it stays in the dirt like a sponge dipped into water, but this only occurs in some soil.” – Savannah. “I learnt that different soils are more absorbent than others.” – Ben. “One of the best days at The Living Classroom so far! The kids were interested and they certainly had a lot of fun. The activities were great and were aimed at the right level. All of the presenters were fantastic.” – Scot Crispin – Teacher. 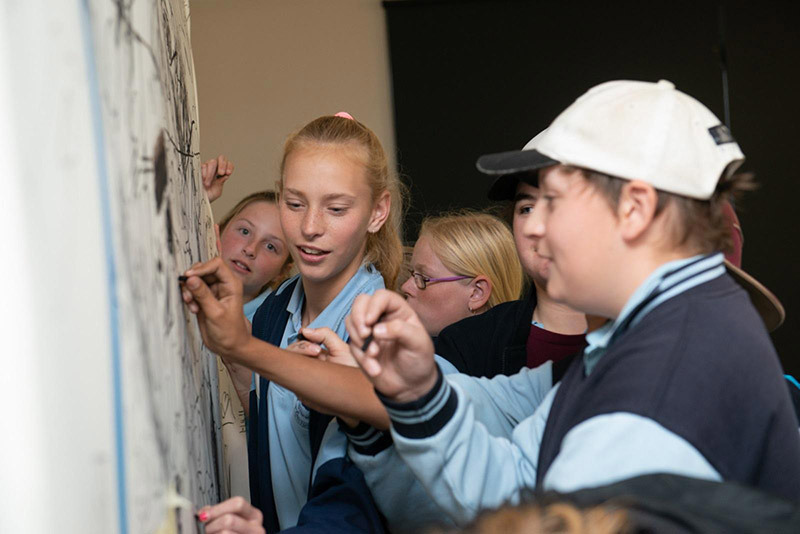 The AFS project is an initiative of the Kandos School of Cultural Adaptation (KSCA), working in partnership with The Living Classroom, Cementa Inc., Starfish Initiatives and Arts North West. It has been generously funded by a Regional Partnerships Grant from Create NSW. You can follow the project at the ksca.land website, or write to info@ksca.land for more information. To learn more about biochar, visit biochar.international. Children at the site of Alex Wisser’s ‘A Hole for The Living Classroom’. 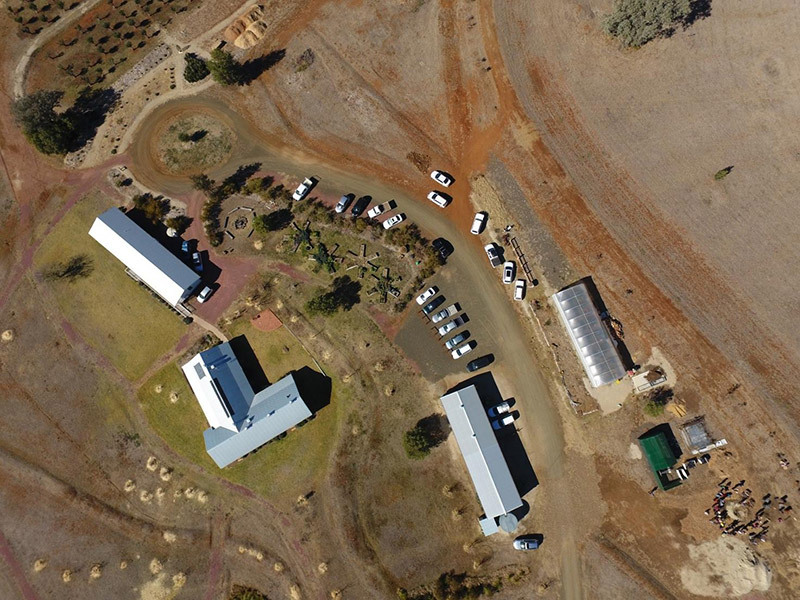 A birds eye view of the Carbon Science: Carbon Culture Workshop at TLC.